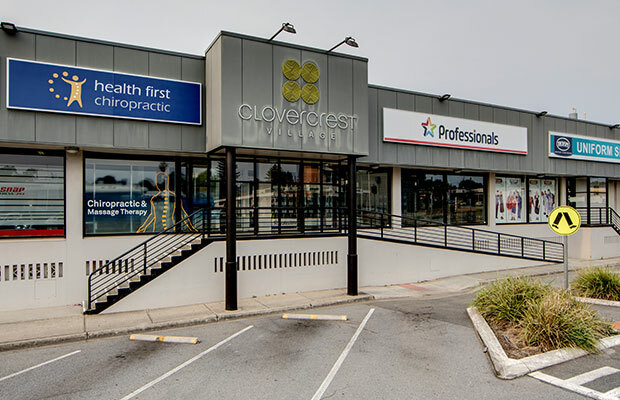 Health First Chiropractic is located on Montague Road at the Clovercrest Village (shopping centre), which is situated near the intersection of Kelly and Montague Roads in Modbury. Clovercrest Village rests on the south side of Montague Road directly across the road from Clovercrest State Swim. Our clinic is positioned on the outside of the shopping centre, directly next to the Snap Fitness gym (we are not inside the mall). Click here to download a printable map with contact details. Convenient car parking is available directly in front of our clinic along the slip road that runs off Montague Road. Public transport is available direct to the Clovercrest Village shopping centre with Bus Stop 29 positioned right out front of our clinic. To contact us with an enquiry or to make an appointment, please use the details below or contact form at the base of this page, and one of our team members will soon be in touch. Please note: All appointment requests must be confirmed by our office.